Dr Sharma asks that you please read through this important information. If you are booking in as a new patient you will be asked to sign the new patient questionnaire to state that you have done so. Please keep this information for future reference. Dr Sharma’s administration team is available between 9.00am and 5:00pm, Monday to Friday. Outside of these hours please contact NHS Direct or your GP practice for any urgent medical issue. Prior to the first consultation you will be sent and asked to fill in and return a detailed questionnaire so that Dr Sharma can study your case before meeting with you. Under circumstances where a patient is unable to travel to see Dr Sharma, he is able to offer a Case Study consultation. As with an in-person appointment, a patient will be asked to complete the New Patient form and return it with any other relevant information such as test results and specialist reports. Dr Sharma will study the case and will prepare a report advising on therapeutic options based on his considerations. A Skype or telephone consultation can be arranged. If necessary, a written report offering any advice given will follow. May 25th, 2018 will see the implementation of a new piece of EU regulation – the General Data Protection Regulation (GDPR). Any business, including private medical practices, will need to work in accordance with the Data Protection Act 1998. These New requirements stipulate that all emails sent from a medical practice that contain names, addresses, email addresses and medical information must be encrypted. If you have an urgent enquiry, please book in a telephone consultation. Due to Dr Sharma’s busy schedule email/postal enquires may not be dealt with for up to 4 weeks. Postal/email charges are pro rata as per consultation (minimum £70/15 minutes). At the time of booking you will be asked to provide debit or credit card details. Cheque payment must be presented 3 days prior to the appointment. Fees will only be charged after your consultation with Dr Sharma. Such payment methods are required to hold a booking. If you wish to pay in cash, please bring that on the day of the appointment and credit cards details will not be used or cheque payment refunded. Dr Sharma Diagnostics Ltd (DSDL) will use and store securely any credit card details you have given to pay for consultations with Dr Sharma and for any tests/investigations. The DSDL accountants also run The Dispensary Bureau Limited (TDBL) who distribute Dr Sharma's and other practitioner's prescriptions. Your card details will be held securely by TDBL as well. Future appointment fees, tests and investigations and products obtained from The Dispensary Bureau Limited will also be charged to this card unless you instruct us otherwise which can be done through calling 01202 744 747. Dr Sharma will endeavour to advise you of charges in the consultation. We thank you and hope you understand this makes accounting a simpler process for both parties in this very large and busy practice. Whilst respecting your right to confidentiality, Dr Sharma would recommend you grant permission for him to advise your General Practitioner of your visit. There is a section in the new patient form for details. You need to discuss with Dr Sharma any reasons you may have if you wish to withdraw permission. There are now so many brands of naturopathic supplements and Homeopathic remedies available on the market quality can no longer be assured on the ‘High Street’. Dr Sharma is continually researching supplements, herbs and remedies that have higher absorption and benefits and has obtained as much assurance as possible that these are pesticide and additive free. To remove the necessity of patient's having to contact more than one supplier to get products recommended by Dr Sharma, he suggests patients use the services of The Dispensary Bureau which stocks the preferred products of several doctors and practitioners. Dr Sharma may recommend the use of intravenous therapy including vitamins, minerals, amino acids, fatty acids and other nutrients. Charges for IV infusions are inclusive of cost price medication, nursing fees, other administration fees, prescriptions charges and contribution to insurance fees. If you would prefer not to use The Dispensary service, please tell Dr Sharma at the consultation. Dr Sharma asks that you contact him one month after the commencement of treatment, keeping a list of any changes or effects at all. Please organise a telephone consultation immediately if you have any concerns. GMC Good Medical Practice requires doctors to be honest and open in any financial arrangements and in financial and commercial dealings with patients and other organisations. Dr Sharma and his wife are not share holders or involved with the running of The Dispensary in any way although the practice, Dr Sharma Diagnostics Ltd, may receive fees when asked to provide advice and expertise. Dr Sharma’s use of both conventional and Eastern approaches allows him to combine conventional and advanced tests and investigations with techniques such as pulse and tongue diagnosis in his consultations. Investigations may include obtaining samples of blood, urine, stool or saliva and occasionally hair. These are sent to specialist laboratories around the UK, the USA and labs in Europe. You may be sent kits or asked to visit laboratories locally for samples to be taken or collected. Dr Sharma will advise you of further fees and charges before obtaining your consent to additional investigations or treatments. Charges for tests conducted through Dr Sharma Diagnostics Ltd include administration and secretarial costs and time set aside for Dr Sharma to report on the results. There is no disabled access at The Basement Clinic. Please advise us in advance if this is required and we will organise an alternative venue. 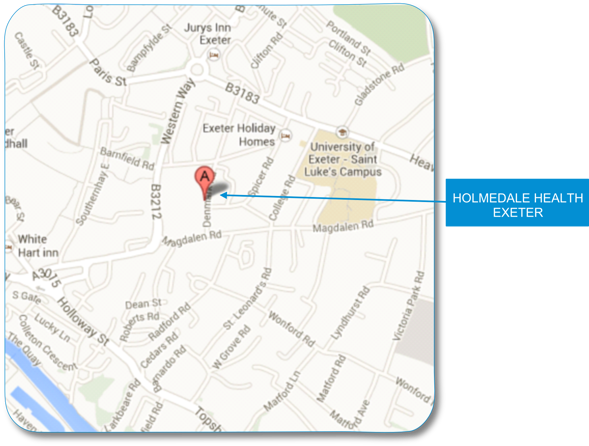 With prior notice a ground floor room can be organized for those who wish to meet Dr Sharma in Exeter. Most medical insurers that have complementary medical cover in their policies will cover Dr Sharma’s fees, as a specialist in homeopathy, up to their capped maximum. It is unlikely that insurance will cover the full fees, nor do they usually cover any tests and investigations, remedies or supplements. A referral letter to Dr Sharma from a specialist or a GP is usually required. Anybody wishing to use insurance to cover costs should first check with their insurers and bring insurance forms for completion to the consultation. It is necessary for you to have received prior authorization from your insurance company. Please note it is necessary for you to pay all fees and costs and then reclaim this from your insurers. Insurance forms filled in or letters written on your behalf at any time after the consultation will incur a charge for completion at the pro rata rate of a consultation and may require a telephone appointment if Dr Sharma feels that there may be any issues arising out of the completion of the form. This may not be recoverable through insurance. A full copy of our complaints procedure can be found on our website www.drsharmadignostics.com or it can be sent to you on request. Dr Sharma works with over 100 orthodox and Complementary practitioners and can refer appropriately if a specialist is required. Please note consultations with specialist colleagues, tests and investigations, courses of treatment and/or medication/remedy programs will incur further expense. It is the policy of Dr Sharma’s practice to ensure that all patients are offered the presence of a chaperone before any examination, treatment or procedure is performed. All patients attending the clinic have the right to a chaperone being present during any examination, treatment or procedure. The patient’s right to a chaperone extends to the patient bringing a relative or friend to accompany them during the examination or treatment. Dr Sharma is certified to treat children and vulnerable adults as is required for any doctor to see children under the age of 18. Employees of The Elixir Clinic, 10 Upper Wimpole St and Holmedale Health cannot act in loco parentis therefore should you need to bring a child/baby with you please ensure that they are suitably supervised at all times. Many initial prescriptions from Dr Sharma will contain homeopathic remedies. Homeopathic remedy action may be destroyed by certain compounds, in particular mint which is often found in toothpaste. An advice sheet will be sent but please note that such prescriptions will automatically include mint-free toothpaste, at an additional cost of around £5, so please advise Dr Sharma or The Dispensary if this is not needed. All supplements and herbal medicines will be labelled. Herbal medicines are effectively nature’s drugs. Dr Sharma will mention this at the time of prescribing but, please note, any such medication may have adverse effects and, like any orthodox drug, these effects can be aggressive (in extremely rare instances, they can be fatal). You should stop any medication immediately if an adverse reaction takes place that you think is associated with treatment and contact your GP, NHS Direct or go to your local A&E and contact Dr Sharma. The INS Basement Clinic is situated down the steps immediately to the right of the door to 11 Upper Wimpole Street, 3 doors down from the crossroads with Devonshire Street. We may be exposed to over 700,000 chemicals a day in our homes. Our clothes and furniture are impregnated with pesticides (when did any of us last see a mothball?) and fire retardants are added to household fabrics. Even the wood in our house is full of preservative. Our computers, when on and hot, are releasing volatile oxidative compounds, and when we heat our wonderfully well-insulated houses all of these chemicals vaporise and release into the draft-free, airless atmosphere.